If there is anything that Trump is good for, it is showing to us all what dysfunction, narcissism, bullying, toxic masculinity and emotional abuse looks like. This is helpful insofar as assisting us to define what these harmful behaviours and traits look like so we can teach ourselves and our children what to steer clear of. It’s like knowing the smell of a rotten egg, so you know not to eat it and make yourself sick. Trump is the proverbial rotten egg. 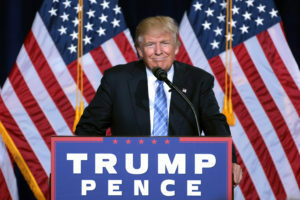 Photograph of Donald Trump at a lectern with a “Trump Pence” sign and two American flags in the background. Photograph by Gage Skidmore via Wikipedia.